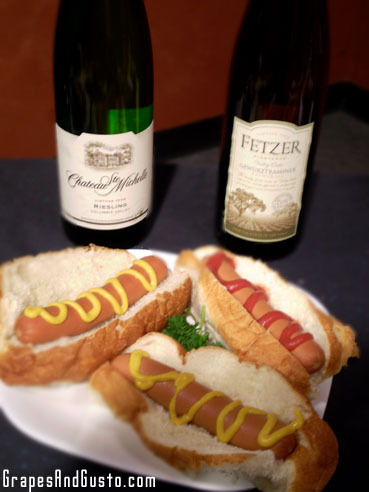 Pair hot dogs and mustard with a mildly sweet version of Riesling or Gewürtztraminer for a sweet-and-spicy contrast. The first thing I’d like to get off of my chest is that, no, not all Rieslings are cloyingly sweet, and no, “Gewürtztraminer” is not what we say when someone sneezes. Close, but not quite. Having said that, there is a phenomenon in which sweet wines tend to calm down spicy foods (this works great with Asian cuisine hot with chili flakes, paired with a well-chilled Riesling). In fact, it is fun to test out this tried-and-true principle in our own backyards, pairing spicy brats, Italian sausages, or hot dogs (the milder cousin, but flavorfully salty) along with some off-dry (and yes, some moderately sweet versions of) Riesling and Gewürtztraminer. I recently paired these not in a grassy suburban backyard, but in a television studio during my appearance on the morning TV segment of “The Pat McMahon Show” (AZTV). One way to build an even stronger contrast of the hot versus sweet is to up the ante on both ends: if you start with regular hot dogs, add some heat to them with different types of spicy mustards. If you are like me, you relate to the foodie’s dream pantry of having 23 different types of mustards (“No two are the same!” we’d argue, as we pondered over a jar of whole-seed or garlic-herb Dijon). The spicier the mustard, the sweeter you can go (to a point—but try and try again. This is not such terrible work). The Riesling can come from Old World sources (i.e., European), especially Germany, in which the sweetness levels are officially classified, and acidity is known to balance sweetness and help avert a syrupy fate; or New World sources, like Australia and California, in which you will find drier versions much more commonly. Older Rieslings are known to have a slight yet distinct petrol aroma (not kidding) but this will likely not come into play if you purchase New World brands geared towards the more ready-to-drink market. Gewürtztraminer, which is (not surprisingly) thought to hail from the town of Traminer (in Northern Italy, near Alto Adige), is often associated with Riesling if only for their common propensity for sweetness and heady aromas. However, Gewürtztraminer does not typically reach the acidity levels of Riesling and is well-known for its signature notes of lychee fruit. The Asian cuisine and Riesling phenomenon is a fun one to try, but today, let’s break out the buns, dogs, and mustard, and have an Oktoberfest in our mouths with our guests of honor: Riesling and Gewürtztraminer. This post is part of a series on summer wine pairings. To see the starting post, click here. Good examples: Chateau St. Michelle Columbia Valley Riesling 2008 (Washington, approx. $9); Fetzer Gewürtztraminer Valley Oaks 2007 (California, $7); Mirassou Monterey Riesling 2007 (California, $9). Even sweeter picks: The spicier the food, the sweeter the wine to complement it. For traditionally sweet Rieslings, try one of these age-worthy gems from the German “doctors”: Dr. Loosen “Dr. L” Riesling 2008 (Germany, $10); Dr. Pauly Noble House Riesling 2005 (Germany, $11); Dr. Thanisch Bernkasteler Lay Auslese 2005 (Germany, $37).